Looking at Elanco’s Benchmark® data over an eight-year period reinforces his point. In almost 7.7 million head of cattle weighing less than 600 pounds, we see an average low of 3.1 percent death loss in Q1 and an average high of almost 3.9 percent in Q3.1 What does that mean to producers’ bottom lines? “In today’s market for six-weight cattle, from first quarter to third quarter that’s a $12.002 increase in your losses across every head placed. Understanding the patterns in your health data can help you identify areas to improve profitability,” said Williams. Using your historical mortality data can help you make educated decisions for what to expect this year. 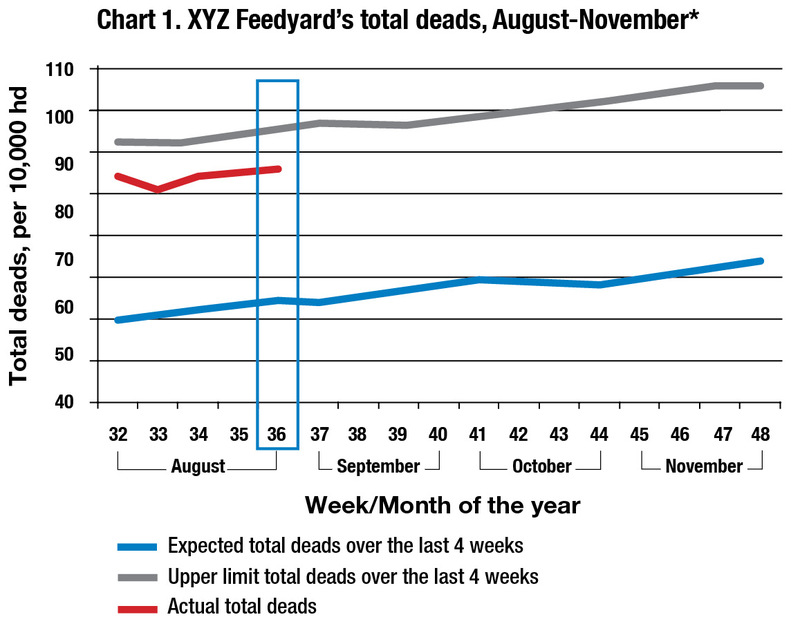 In an example for XYZ Feedyard, Chart 1 illustrates that 64 deads would be expected per 10,000 head for the rolling-four week period ending the last week in August (based on a four-year average). However, 86 deads occurred during that period this year. Looking specifically at respiratory mortality, Chart 2 shows that 34 deads were expected, but the data shows there are 49 respiratory deads. Williams suggests that producers ask themselves if their death loss is coming from a certain risk of cattle, and if so, is there a way to mitigate that risk? Looking at your herd-health protocol may provide you opportunities for improvement, such as metaphylaxis treatment upon arrival, updating vaccine protocols and detecting sick animals sooner through closer observation. By looking at your data early in the season, you can take corrective action sooner and help ensure that your new protocols are making an impact. Producers can use real-time data to let them know that deads may be an issue, which can lead to further investigation. For more information on how to maximize data and analytics for managing health, talk to your Elanco sales representative or technical consultant. *Data for illustrative purposes only. 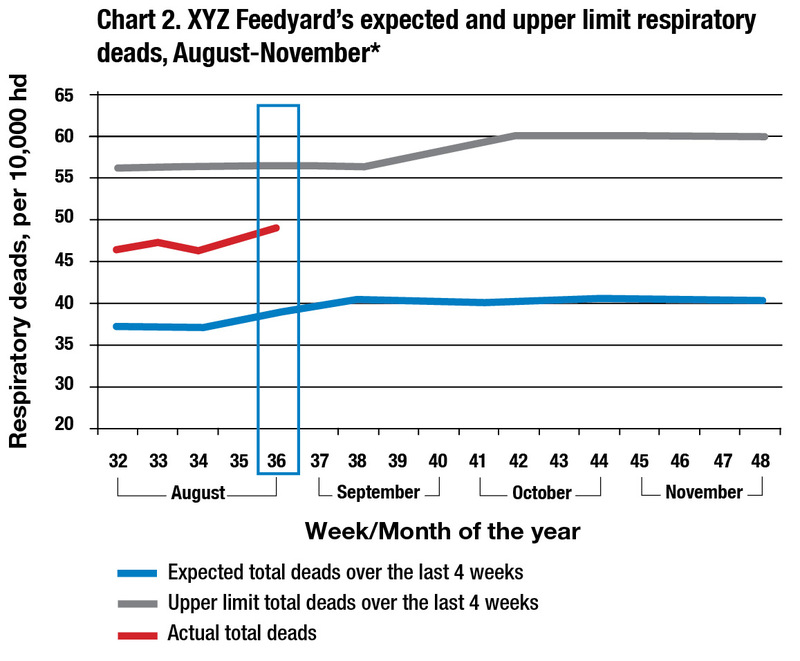 Fictitious data shown expected and upper limits for total and respiratory deaths per 10,000 hd of inventory for August-November based on 4 years data. Upper limits are for a 95% confidence intervals.